Categories: Lifestyle, Sports, Paginated Pages. 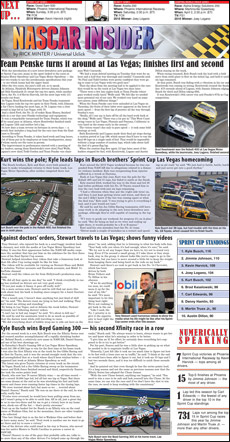 NASCAR INSIDER, featuring premier NASCAR reporter and writer Rick Minter, offers two opportunities each week for readers to get a complete update on NASCAR news. 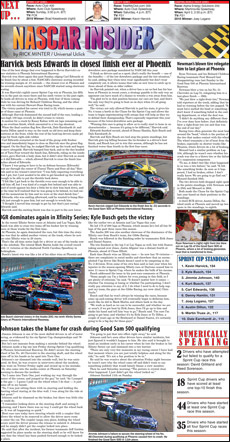 The first page, available before noon every Tuesday, offers a look back at the previous weekend's races and a look ahead to the next ones. The second, a half-page available by 5:00 p.m. Thursday, contains updated reporting, allowing you to publish twice a week for one subscription price. 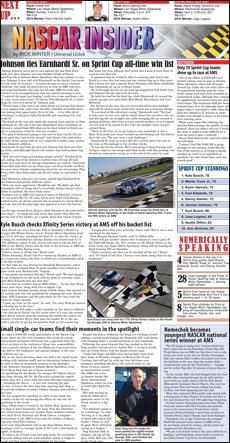 NASCAR Insider offers original reporting, interviews and photos you won't see anywhere else. This feature is available as a composed page, in either color or black & white, and as text only. It is editable for your own customization and has an optional 6-by-5 strip across the bottom that allows you the flexibility to place ads on the page. Rick Minter is an award-winning writer with a serious passion for racing. He began attending NASCAR races in the early 1960s, when his dad, Jim Minter, a former editor of The Atlanta Journal (now The Atlanta Journal-Constitution), began writing about the sport. Rick Minter spent most of his spare time in the early 1970s hanging out with Bill Elliott, working on the first cars that Elliott drove on NASCAR's top circuit. He helped prepare cars that raced on all surfaces - from the short tracks in Georgia to the super speedway at Daytona. In 1977, Minter began compiling results from short tracks in Georgia and submitting them to The Atlanta Journal-Constitution and several Atlanta radio stations. He also worked as a stringer for several short-track racing publications. 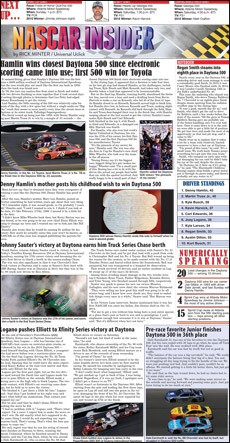 In 1989, Minter joined the staff of the News-Daily in Jonesboro, Ga., covering auto racing and writing and producing a monthly racing newspaper. In 1991, he provided short-track coverage for The Atlanta Journal-Constitution and also assisted with coverage from the top NASCAR circuits. In 2000, he took over the NASCAR beat at the newspaper, writing daily stories from his office at home, where he can hear the cars practicing at nearby Atlanta Motor Speedway. Rick has worked on a freelance basis only since the end of 2008, for The Atlanta Journal-Constitution, he is also a senior writer at RacinToday.com. Minter, who has won several awards for his work, recently was honored by Atlanta city officials for his coverage on pioneer racers, including the Atlanta Stock Car Club, an all-black circuit that ran in Georgia in the 1940s. He also collects racing memorabilia from the 1940s-1970s, which has provided an invaluable resource for stories he has written for the newspaper.